Blueberry Pomegranate Chia Jam is seedy, lemony and full of blueberries and pomegranate arils! This jam is refined sugar-free and made with just five ingredients! It makes the perfect topping for toast, waffles or sweet breakfast bowls! In a small sauce pan, add the blueberries, pomegranate arils, lemon juice and zest and maple syrup. Bring to a low boil and let simmer for about 15-20 minutes until the fruit has softened. Remove from heat and mash the berry mixture with a fork or potato masher. Stir in the chia seeds. Cover and let sit for 20 minutes to allow the chia seeds to plump and the jam to thicken. Store in a mason jar or airtight glass container, and enjoy within 2 weeks. This recipe makes a thick and seedy jam. If you prefer your jam a little less thick and seedy, just reduce the amount of chia seeds. If you prefer your jam a little sweeter, just add more maple syrup. 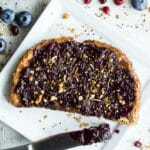 You can use fresh or frozen blueberries and pomegranate arils in this recipe. If you use frozen, just simmer the berry mixture for a few extra minutes.